You know those scenic drives where you can’t believe what’s outside your window and you keep pulling over for pictures? Well, that’s exactly what it’s like driving down the Needles Highway in South Dakota. Expect to see crazy rock formations and epic landscapes in the Black Hills. We found ourselves turning around and driving back through the Needles Eye tunnel on Needles Highway three times. 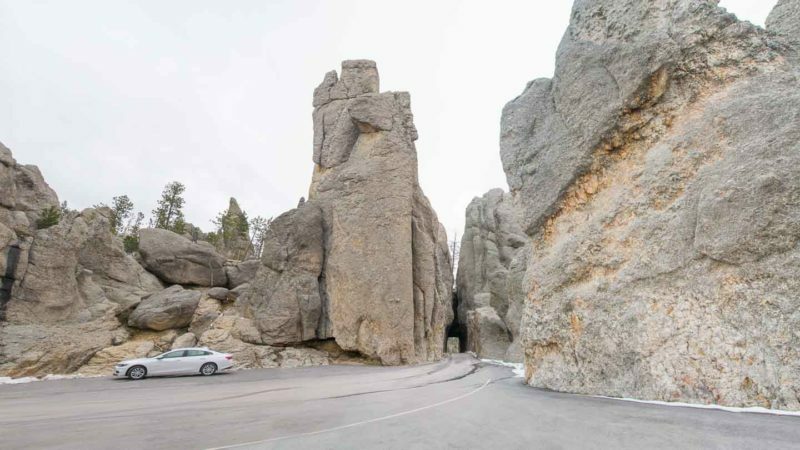 We’ve put together everything you need to know about the Needles Highway. 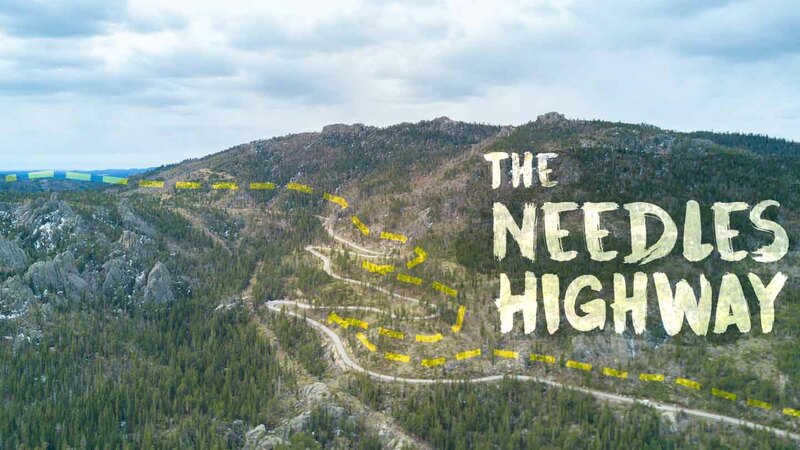 Where is the Needles Highway? The Needles Highway is part of the South Dakota 87 toll road that is located inside Custer State Park in the Black Hills of South Dakota. The portion of the highway is called the Needles Highway due to the tall granite peaks aka needles. It’s 14 miles long with tons of granite needles, sharp turns, and low rock tunnels. It’s located only 30 miles from Rapid City and 35 minutes from Mount Rushmore. It’s one of the best things to do near Mount Rushmore. When Was The Needles Highway Constructed? The highway was completed in 1922 when it was told it would be impossible to complete. The whole road was marked by foot & horseback by former South Dakota Governor Peter Norbeck. When is the Needles Highway open? The highway is closed during winter months due to weather conditions. It’s typically open April through October. We took our South Dakota road trip the first week of May and was open HOWEVER it did snow while driving on the Needles Highway. You’ll have to pay the Custer State Park admission fee of $20 per vehicles/ $10 per motorcycle which allows you to visit the park for up to 7 days. If you are traveling non-stop on US Highway 16A tell the park ranger and you’ll be exempt from the admission fee. The most famous part of the drive is the Needle Eye Tunnel. This one-way tunnel is only 8′ 4″ wide by 12′ 0″ high. Before entering the tunnel make sure no other car is coming from the other end and gauge the size of your vehicle. It’s a tight fit! Make sure to pull over and check out the actual rock formation that looks like an eye of a needle and where the highway got its name. It really does look like an eye of a needle. It’s a windy road that weaves through Custer State Park so don’t be in a rush. Slow down and enjoy the scenery. On average, the speed limit is 25 miles per hour. Give yourself about 45 to 60 minutes to drive the entire 14 miles. Even though it is called a highway it is most common with tourist and not used by locals on a daily basis. There are several places to pull off to take in the landscapes. The rock formations that pop out of the ground are out of this world. There are several pull-offs for some spectacular views. Despite lots of misinformation online, as of 2017 drones are not permitted in Custer State Park and along the Needles Highway. In previous years they were allowed, but in 2017 South Dakota State Parks adopted national parks rules in regards to drones. Which is really too bad because the park would look sick from above and in the spring months there’s hardly anyone in the park. Regardless the park is beautiful through the lens of a flying or non-flying camera. If you have time, give yourself the entire day to explore the park. There are tons of great hikes, or you can rent a kayak, go on a horseback guided tour, join a Buffalo Jeep safari, and much more. We highly suggest spending a night or two either camping in the park or in a nearby hotel. 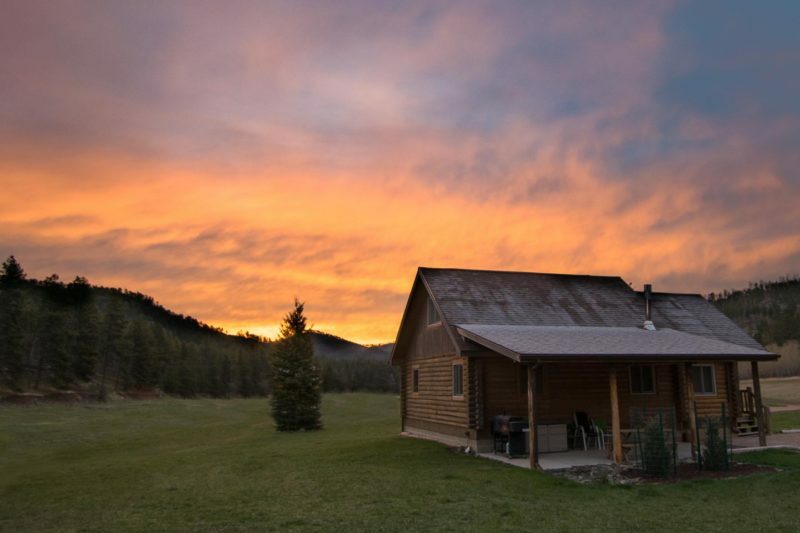 Rent an entire Cabin on Airbnb. Get a $40 credit when you book your trip! –>> sign up here! We spent the night in a Hill City so that we were able to visit Custer State Park over two days and drive Needles Highway twice. The first day we visited we ended up in a whiteout snowstorm with no view, so it was a must to return the next day. The Sylvan Lake Lodge has great views of the lake and located right in the park. Have you driven down Needles Highway? Any tips you’d like to add leave below in the comments we’d gladly add them in. Drove the needle highway 2 years ago with family. It was everything dwscribed above and then some. There are places to pull over ao you and the kids can explore till your legs say uncle. I have some great pictures I’ love to post. The sights in Custer State Park are insanely beautiful and have to be experienced first hand to be truly appreciated. 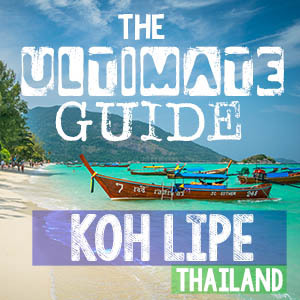 A must for everyone’s bucket list. We just left Custer State Park and can hardly wait to go back. We have a 350 Duli so driving on the Needles Highway didnt happen, there is NO WAY you will fit without ripping off your fenders. However, you can still drive toward the Needle Tunnel, park, and walk through it. Just doing that was worth the price of admission. We went hiking around Sylvan lake with our 2 dogs after and that was awesome. Our dogs are both 10y/o and they were able to do the hike around the lake with no problem. Last note: we have a truck camper and staged at Game Lodge Campground. It was fantastic, super clean with REALLY NICE showers and bathrooms in addition to having full hookups. They were also celebrating their 1st annual Ranger led Halloween night hike and many of the rv’s were decorated with orange lights and other fun Halloween decor. The finishing touch for a great day; the Ranger educating us that they have the largest wild herd of bison in the nation that are cared for and managed sustainably. Then we saw two bison on the road next to our truck on our way out of the park; spectacular!!! They also have horse camping with cabins so we will be back FOR SURE!! The narrowest tunnel is 8′-4″, we saw some pretty big buses go through – but measure twice, get stuck none! It’s an awesome part of the world here! We were just there today. Breath taking! Even had two mountain goats on the road! You should stop ar Sylvan lake and climb on the rocks. So fun! That’s awesome! It’s such a great drive! I take it if you have a dulley truck this is probably not a good road to take because of the tunnel??? We can’t 100% comment on that, I am sure every truck is different in exact measurements. You can def drive up to the needle and park and judge for yourself. We did see a tour bus go through there, you might be okay but check it out before trying. Safe travels in South Dakota. Breath taking views, so beautiful. The badlands were also beautiful, and amazing. We went also to the mammoth place, which is a must, even if you are not into that, I wasn’t but, I wanted to see and learn more. Deadwood was also great, so much history, it was awesome. Be sure to stop at a hot spring, its free and so relaxing. We also loved Sioux Falls, which is breath taking too. Thanks for the additional tips! I randomly found this looking for things to see on our SD trip. Amazing blog! I might have sat here surfing your site as my kids fought in the background wishing I’d made different life decisions 😆. In any case- looking forward to sharing the beauty of SD with my kids! We love hearing that! I am sure you and the kiddos will have a blast in SD. We decided to travel first and children will have to wait and come later in life. Thanks for the great info. We will be going there in Sept and can’t wait to drive Needles HWY. September will be a great time of year to drive the Needles Highway as the summer rush will have passed. South Dakota is amazing, we hope you have time to visit the Bad Lands National Park too it will blow your mind. Safe travels to South Dakota. We hope you have an amazing trip to South Dakota. Are you going on a South Dakota road trip? What other highlights in South Dakota do you have planned? ooh That’s where the name needles comes from…hehe! Thanks for that. Yep that’s where it gets its name from. It’s crazy, isn’t it!?!? A nice post with many beautiful photos. The scene of Needle Eye Tunnel amazes me, to see a structure that old is still in good condition. Thanks for the nice one again…. The tunnel is crazy and yes still in great condition. Have you driven through it? The Needles Highway is a must when in South Dakota.